At NTUU KPI you can get a Bachelor Degree in 77 Academic Programs/Majors. National Technical University Kyiv Polytechnic Institute is famous for its academic excellence and leading innovative research. That is why the study in our University attracts the best and brightest applicants. We always welcome applications from international students irrespective of their background. The most difficult and important step for you right now is to choose the right Bachelor Degree and the Academic Program to follow your own areas of interest. 1. You may begin with looking over the most exciting and interesting Academic courses in the University Academic Programs/Majors Catalog, which will determine the Institute or College that offers these Academic Programs. So, you will know exactly the Institute or College you can apply to. 2. You may also begin with looking over the list of available Institutes or Colleges, and then find the Academic Program/Major to receive the Bachelor Degree of your choice. 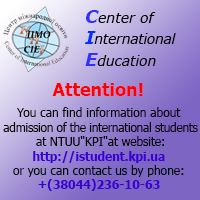 All international students who come to study at NTUU KPI are offered one academic year of intensive study of Ukrainian or Russian Language, which will be the main language of teaching, as well as a possibility to improve their knowledge of main subjects according to the future Degree, e.g. Mathematics, Physics, Chemistry, Biology, Geography, Economics, etc., at the Preparatory School of NTUU KPI. International students can get a Bachelor Degree studying in Ukrainian or Russian within any Academic Program. 72.2. Telecommunication Systems and Networks. All applicants shall fill in an Application, and submit copies of Passport, Diploma/Certificate, and Transcript translated either in Ukrainian, Russian, or English. "The educated differ from the uneducated as much as the living from the dead." " - No one desires evil. - No one errs or does wrong willingly/knowingly. - Virtue - all virtue - is knowledge. - Virtue is sufficient for happiness." "All our science measured against reality is primitive and childlike, and yet it is the most precious thing we have."